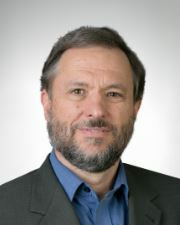 Dr. Stephen Zunes is a Professor of Politics and International Studies at the University of San Francisco, where he serves as coordinator of the program in Middle Eastern Studies. He also currently serves as a senior policy analyst for Foreign Policy in Focus project of the Institute for Policy Studies, an associate editor of Peace Review, a contributing editor of Tikkun, and as an academic advisor for the International Center on Nonviolent Conflict. He is the author of scores of articles for scholarly and general readership on Middle Eastern politics, U.S. foreign policy, strategic nonviolent action, international terrorism, nuclear nonproliferation, and human rights. He is the principal editor of Nonviolent Social Movements (Blackwell Publishers, 1999), the author of Tinderbox: U.S. Middle East Policy and the Roots of Terrorism (Common Courage Press, 2003) and co-author (with Jacob Mundy) of Western Sahara: War, Nationalism and Conflict Irresolution (Syracuse University Press, 2010). 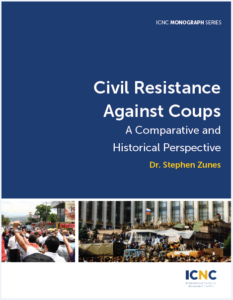 Watch the Webinar Recording of “How Can Civil Resistance Work Against Violent Coups,” by Stephen Zunes, offered by the ICNC Webinar Series on December 7, 2017, on the occasion of the release of this monograph.